Making is rather complicated. I think that there is no problem in terms of function, but I felt that coverage with soldering and core wire with silicon was bad. This review is about item#43379804. Thankful for inexpensiveness, adhesion treatment etc is miscellaneous. I am concerned about the catch of the fuse box. This review is about item#43379795. I used it for Mercedes Benz. Until now I was using a certain manufacturer's item at a car accessory store, but this one is cheaper. It will be necessary soon, so shipping the day is appreciated. 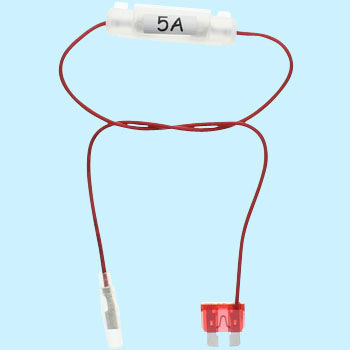 Although it is quality, although the connection part of the flat fuse and the electric wire feels sloppy, I do not care about it because it is an invisible part. Three months have passed since I was wearing it, but it works well for me. Bike accessories saving of power takeout. I bought it to attach a USB power supply to a motorbike. I was able to install it without problems and it can be used without problems. We do not recommend the Monotaro brand because there are many defective products of glass tube fuses and caulking defects of Giboshi. I bought 20 pieces, but there was only one problem. Used to take out power from the fuse box. There is no problem as long as the current is within the allowable range. Is the lead wire a little longer? You always find what you want. I am shopping very conveniently. As the fuse burned out, the satisfaction level is 2. Because it is this price, I gave up and used it only for taking out the power supply. Packaging is exaggerated, I wanted it to be an e-mail service. This review is about item#43379813. It is a useful item with a fuse, usability is good and no problem. One out of five items Soldering was incomplete and there was an item floating in the cord with no current flowing. I fixed the solder. There were two items of glass tube fuse defective past two times. I am using it because it is cheap, but I recommend using it after conducting the energization test before use. Even beginners can easily take out the power supply so much helped. Take out power supply when installing automobile equipment. Since the tube fuse is in the middle, it can be used with confidence. There are solder defects inside the tube fuse only once but I use the energizing test for safety just in case. I am saved because the price is cheap. I will purchase repeat. Purchased because it was cheaper than a certain maker item. I do not feel particularly trouble. It is good to be able to take power easily. I will also purchase it. I am satisfied and able to use it normally.